The Statue of Liberty has the Blues. This beautiful statue, a gift from the people of France, is the only historic figure of a woman that is known worldwide. She represents what's good about America, This art exhibition is an exploration on what this statue means to America, and how the values she stands for have been challenged. Artist, Terry Rooney explores her muse in many settings, in a multi-media exhibit in Westfield this Spring. Liberty once was celebrated with a poem by Emma Lazarus, "Give me your tired, your poor." But those idealistic goals of our forefathers, were trampled on by a succession conservative presidents who made it difficult for immigrants to come to America. Liberty has shown her torches light during 9/11 but began vanishing during the Bush presidential years, as our rights to privacy disappeared and survelliance on ordinary citizens is gathered. Vanishing Liberty, earsed charcoal drawings of the statue brings home this point. 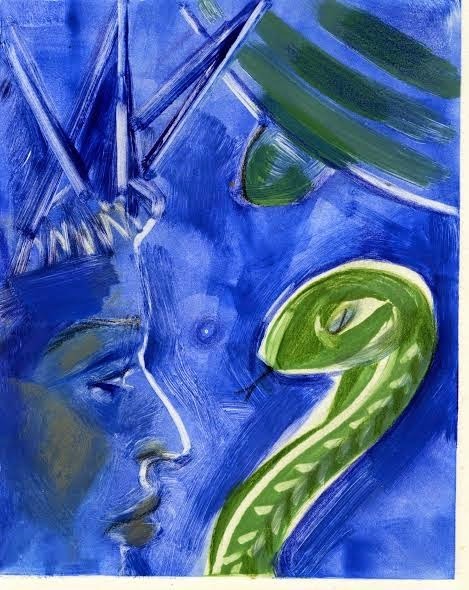 The Statue of Liberty and the snake is a metaphor of our times, when evil creeps into our country, our society suffers as a whole. LIBERTY BLUES, opens this week at Arno Maris Gallery at Westfield State University, 577 Western Ave., Westfield March 5 - April 18. This exhibit is a retrospective with over 30 years of artwork of this heroic statue which shined in the harbor of her hometown, New York City. Recent addition to this exhibition is a Liberty holding a brush, to honor the French people recovering from their recent terror attack. 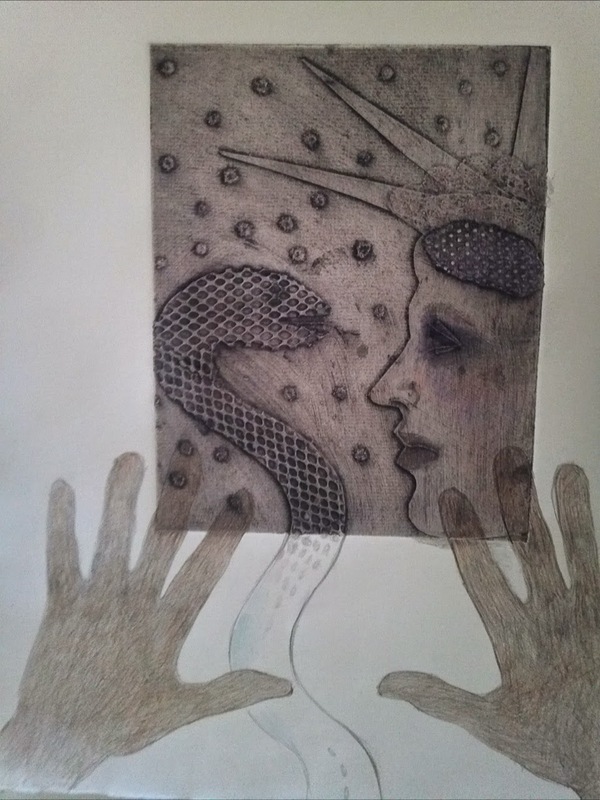 Also another recent addition is collograph and drawing entitled, "Ferguson."